Great get away from it all Cabin with great sunrise views. 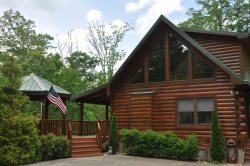 We chose the cabin for the price and location, it was central to our plans at Nantahala and Little Tennessee Rivers and Bryson City. Great people at GSCR that were very welcoming and accommodating when we decided to extend our stay. GSCR is very easy to work with. Absolutely no problems! Loved loved loved Laurel Branch. Clean, cozy and perfect for myself and my husband, my brother and sister-in-law. The cabin is beautiful! Highly recommend Laurel Branch! Team members were wonderful very patient and took a lot of time explaining things to me. I chose this place because of the excellent customer service I received. The cabin was very nice and secluded, we liked the design of the cabin. The cabin was perfect for our needs. A day of fishing followed by a nice soak in the jacuzzi made it a perfect weekend. Beautiful cabin and great memories made! The cabin was great, the staff is very friendly. We loved bring in the mountains! Thank you for allowing us to stay here. We had a great time! Here for the International Whitewater Hall of Fame. It was unbelievably wonderful to wake up to the peace and quiet and beauty. This is our families second vacation stay in the Laurel Branch cabin. It is just as charming as we remembered. Our girls enjoyed the Hot Tub at night after a day exploring. This trip we enjoyed seeing waterfalls on Deep Creek Trail, horseback riding and zip lining. Had a blast. The cabin was the perfect spot to decompress at the end of the day. They were very friendly. They even called to make sure that we made it to the cabin alright! Everyone was very nice and helpful. The directions were perfect! We Loved the cabin. We loved the dusting of snow, it was perfect. Thank you for sharing your cabin. It was a very relaxful and peaceful weekend. THe cabin was more than expected. All of the tools that were needed were provided. Even tho some places were still closed for the season we were still able to see some amazing views. "The Road to Nowhere" has an incredible view and also the mountain trails were great. We will be back soon. Anyone we spoke with was very polite and accommodating. I cannot wait to go back to Laurel Branch! Ever since we stayed it's become my favorite place to be. It's beautiful and private. Very well maintained and clean. We're planning a return trip for this year. I cannot wait! We had a wonderful stay here! We visited TN Great Smoky Mountain Train Ride, Biltmore, Cades Cove and family time. We had so much fun cooking and relaxing in the hot tub. We had our first family vacation this week. We loved the town of Bryson City. and taking our daughters on the Polar Express. We loved relaxing on the porch and in the hot tub. We love the cabin and how beautiful the cabin is. We are already planning our next trip in the summer to go rafting. Thank you so much. We are happy to have stayed at this cabin. The cabin was perfect, we loved relaxing in the hot tub and taking in the views. We can't wait to come back. We had the best time! The fishing down at the Little Tennessee River was fun. Bryson City was very friendly. We loved driving the parkway it was so peaceful. The cabin was so cozy we will be back.